Fully equipped resort with many activities for adults and kids! Buyer may receive a title fee credit, inquire for details! Overlooking the turquoise Caribbean Sea, the *Westin Lagunamar Ocean Resort* enjoys a tranquil setting along a beautiful unspoiled beach. Intuitively designed to suit your personal needs, the resort will refresh your spirit while placing you only minutes from Cancun's energetic nightlife. Spacious, richly furnished studio, one-bedroom, and two-bedroom villas feature ocean views, hand-selected art, and other distinctive touches that reflect the area's culture and environment, while inspiring rejuvenation. 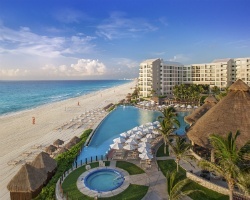 The resort offers convenient access to beaches, restaurants, shopping, golf courses, and excellent diving sites. For more information, visit www.vistana.com. *Interval International Elite Resort* Featuring a finely appointed studio premium villa, with 1 bath that will accommodate 2 guests comfortably. Usage is annual in a floating, platinum plus season week. RTU in perpetuity. For more information or to make an offer, please submit the inquiry form.